The graceful Killer Whale is also known as Orca is the largest member of the Dolphin family. On the Northern end of the Vancouver Island is found the Northern Resident Killer Whales who spend the summers cruising mostly the waters of Johnstone Strait, Broughton Strait, and Queen Charlotte Strait. The killer whales which summer around Vancouver Island, ie the residents, have their own dialect which as well as being different from transient whales it also differs between family groups of whales (called pods). 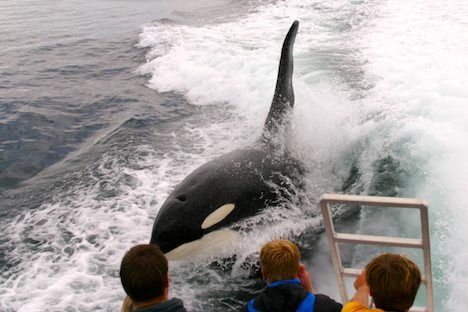 Passengers of a wildlife watching boat get a thrill to see a killer whale surfing in the waters off Northern Vancouver Island, BC, Canada. Picture of a large male killer whale surfing beside a boat off Northern Vancouver island, BC, Canada.